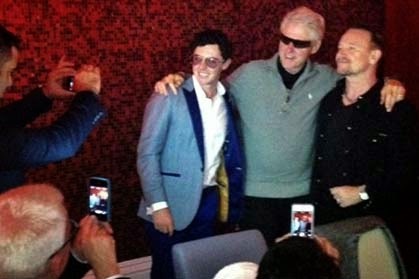 Former President of the United States Bill Clinton tried on his buddy Bono’s iconic shades for size while hanging out in Dublin with his golfing wing-man Rory McIlroy. On Wednesday night the celebrity trio were snapped at a sit-down dinner at Fire Restaurant, next to the Mansion House on Kildare Street. As the photo shows camera phones were out in force to capture the moment. Last month Bono showed off his comedy chops doing a pretty impressive impression of Clinton on stage at the Clinton Global Initiative gathering, in New York. Clinton then returned the favor, including sunglasses, while appearing on Piers Morgan’s CNN show.